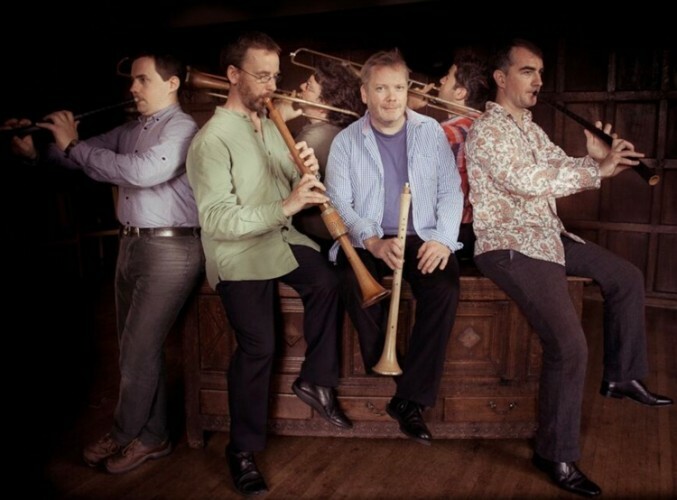 City Musick, the London-based Renaissance band led by William Lyons. CD REVIEW — From Medieval times though the early 19th century, cities and towns around Merrie Old England employed bands of professional musicians to perform during civic and ceremonial events. Why these are the city waits, who play every winter’s night through the streets to rouse each lazy drone to family duty. These are the topping tooters of the town, and have gowns, silver chains, and salaries, for playing “Lilliburlero” to my Lord Mayor’s horse through the city. 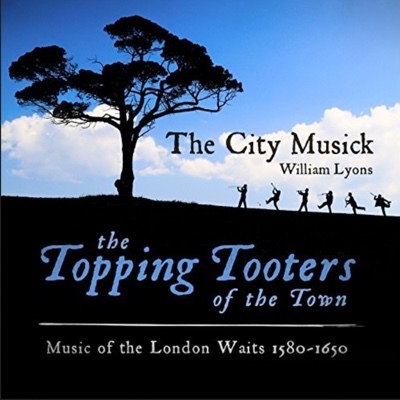 Thus begin the liner notes for The Topping Tooters of the Town: Music of the London Waits 1580-1650, the latest CD from William Lyons and his top-notch, London-based Renaissance band, The City Musick, which takes its title from Ward’s flight of alliteration. By 1600, the population of the city of London had overflowed its Medieval walls and a younger, more urbanized audience clamored for musical and theatrical entertainment. The Waits, performing mainly on wind instruments — shawms, dulcians, cornetts, and sackbuts — filled the city’s expanding musical needs. 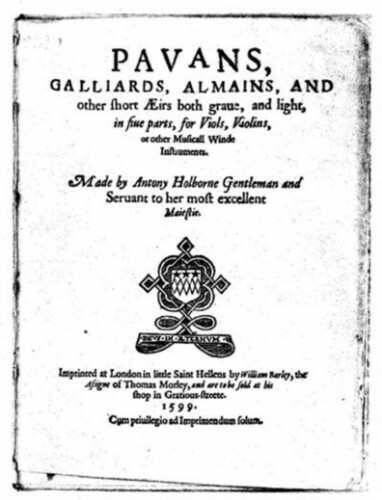 Widely hailed as England’s best musicians, in addition to their civic duties the London Waits may have given the first public concerts in England beginning in 1571. This brilliant album pays homage to their important role in London’s musical life around the turn of the 17th century. Since its founding, The City Musick has appeared at Shakespeare’s Globe Theatre and at the BBC Proms, as well as at traditional feasts and ceremonies in the City of London, at Ham House, and at the York Early Music Festival. On this recording, eight of the eleven musicians play outdoor instruments — shawms, dulcians, hoboys, bagpipes, cornetts, sackbuts and lysard — as well as members of the more domestic recorder family. Three appear only as singers. The disc opens with a spirited “tooting” of Anthony Holborne’s The Night Watch by the outdoor instruments. Other works by Holborne include The Cecilia Almain, stylishly performed on sackbuts, cornetts, and bass dulcian. Of Holborne’s three works performed on recorders, Paradizo is highlighted by lovely phrasing and ornamentation of its expansive melodic lines. Recorders are also highlighted in Peter Philips’ dolorous Pavane and Galliard, as well as in excerpts from Thomas Morley’s First Booke of Consort Lessons (dedicated to the London Waits), and pieces from his three-voice Canzonets. Waits also supplied music for dances, plays, and masques at the Inns of Court — Grays Inn, The Temple, and Lincoln’s Inn — which provided finishing schools for young men before universities came to town. Three Courtly Masquing Ayres from 1621 by John Adson, a Wait himself, represent music played at these entertainments. Here, The City Musick “brass” — cornetts and sackbuts — vibrantly capture Adson’s infectious syncopated rhythms. A set of seven pieces by the ubiquitous Renaissance composer Anonymous, arranged by Lyons, alternates loud and soft instruments in lively tunes, stately dances, and nimble shawm duets. The only piece by a foreign composer, Valentin Haussmann’s All ye who love, with its crisp articulations by shawms, dulcians, and sackbuts, beautifully sets up the final group, Lyons’s arrangements of dances by John Playford. Bagpipes add a new timbre to the proceedings in such as the aforementioned Lilliburlero, which leads directly into Maiden Lane, a lilting dance performed on shawms and sackbuts. Bagpipes return during Halfe Hannikin, and then the rest of The City Musick ensemble joins in for a rousing account of Sellengers Rownde, bringing the CD to a vivacious conclusion.